I usually have to unclog a few sprinkler heads when I do my weekly system check, but I was in for a treat on Saturday when almost every single head was clogged! You see, the city did some work on the secondary water lines upstream from my house and, as a result, flooded my pipes with decades of sediment. Always one to look for the bright side of any situation, I decided this was a good excuse to make a little sprinkler filter cleaner that’s been kickin’ around in my head for a while now. 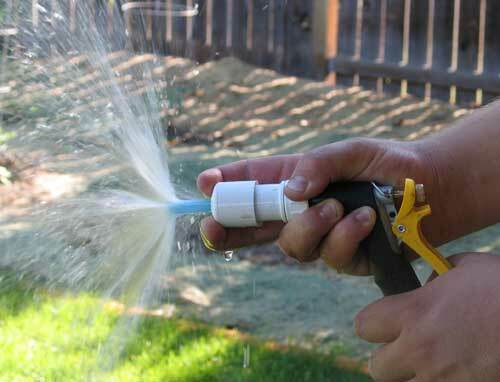 So if you have sprinkler heads with individual filters (like many RainBird, Orbit and Toro brand heads), read on after the break how to make one of these handy gadgets in about 5 minutes for under $12. The sprinkler system in my yard is, without question, the bane of my existence: a hodgepodge of every sprinkler technology from the last 55 years built on a foundation of galvanized steel pipe that was salvaged from a construction site in the early 1950′s. This doesn’t really have much to do with the project — I just like to take every opportunity I can to complain about this setup. Suffice it to say that about a 1/3 of my sprinkler heads have been upgraded to the fancy kind with the individual filters, which are much better than those without. 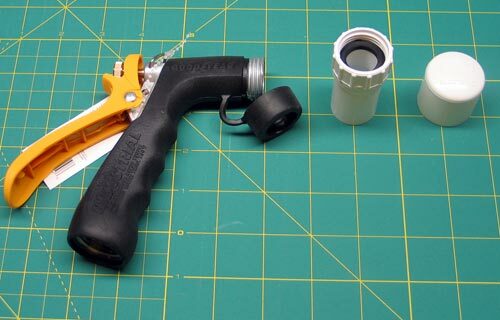 Pistol Garden Hose Nozzle with Threaded Nose: $10 from Home Depot, but they only had the industrial one made by GoodYear. You should be able to find one cheaper at your local mom ‘n’ pop. Drill a 29/64″ hole in the center of the pipe cap end. It’s easier to drill if you’ve got a punch to start the hole, but probably not necessary. Screw the pvc pipe adapter to the nozzle. Just drop your filter into the hole in the cap, slide the cap over the adapter and hold on to it tightly while you squeeze the handle. Almost as tough as the assembly. 29/64″ was the perfect sized hole for filter in my RainBird and Orbit heads, but you’ll obviously want to measure for whatever filters you have. 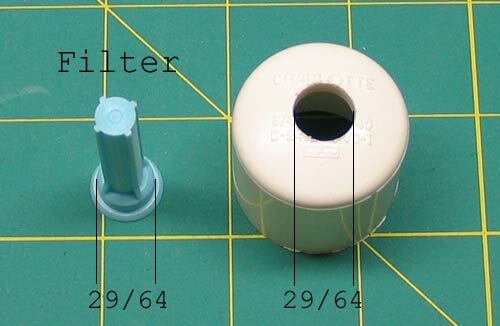 You can easily get multiple caps and drill different-sized holes in them for different filters, I suppose. You could always get a hose-to-PVC pipe adapter that’s threaded on the pipe end and a threaded cap to guarantee you don’t have to hold the cap on, but I opted for the slip fittings for rapid-fire filter cleaning.